Classic Whey is nothing but the highest-quality WPC-80 (whey protein concentrate 80% - the highest grade whey concentrate) and full transparency labeling! And the PUMPKIN PIE Seasonal Flavor is a HIT! 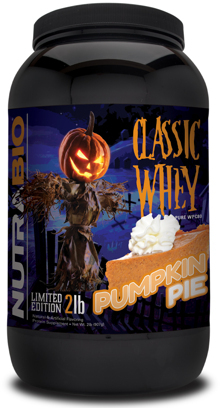 Two decades ago NutraBio launched a protein powder that was so simple and honest it makes you wonder why it took the industry so long to catch on, our 100% Whey Protein Con- centrate (WPC80). This product has never been protein spiked and never contained proprietary blends, fillers or excipients. Now, 20 years later, it stands tall as the industry's standard for clean, affordable protein with full label disclosure and absolutely no BS. It is truly a classic, which is why we just renamed it "Classic Whey." It's made from the highest quality form of whey concentrate known as WPC80 and is just 10% lower in protein than our elite 100% Whey Protein Isolate. Our Classic Whey contains only WPC80 and is not blended with any cheaper whey concentrates like sweet whey, WPC34, WPC45 or any other garbage. This supplement has NOT been amino or nitrogen spiked. As always our label has full disclosure so you know exactly what you're putting in your body. Another example of how NutraBio has been looking out for you for 20 years. Clean, honest supplements from the brand that never compromises. This is the purest grade; non-denatured whey protein concentrate made from 100% American made USDA Grade A milk. This product contains no artificial sweeteners or flavors and no added sweeteners, fructose, L-Tryptophan, salt or acid-treated whey. Other than whey protein which comes from milk, this product contains no animal-sourced ingredients. Although this protein is 97% lactose free, we recommend our Whey Protein Isolate which is 99.5% lactose free for lactose in intolerant individuals.